So, this was that sight that greeted Mother this evening. She was not amused. And, I admit the whole tugging, pulling, hair-yanking nonsense day after day to remove the burrs is getting well past old. I was artistic at least, don't you think? Even my braids didn't help much. They did make it easier to comb out, but they still attracted burrs. Mother says my neck is still nice enough to pull off the no hair look. I blame Mother for my neck not being as pretty as it used to be... my tiny teeny hole hay bag is causing the underside of my neck to become more muscular. I admit, it is nice to have Mother curry where my mane grows from... the lightness, the freedom. And the flies have been not too bad this year, so I didn't really need all that extra hair, anyway. 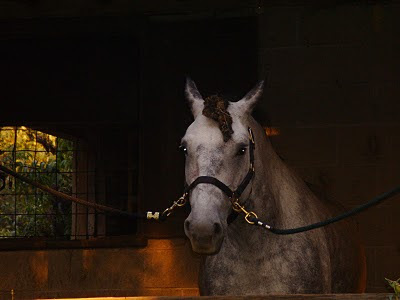 She said my forelock wasn't helping much when it was just a clump of burrs; I suppose she has a point. And I am really excited to not have to spend anywhere from a quarter of an hour up to two hours an evening being deburred, perhaps unbraided and rebraided... sigh. What price freedom? I blame it on Fenway Bartholomule, personally. He made it look so chic, how was Mother to resist? Ooooohhhh man.... I think I would have grabbed the clippers too! Mother says it was becoming a quality of life issue. She would not leave the burrs in, but imagine how it felt to have that (sometimes, obviously, less) removed every evening for a month or two. I started feeling a little sense of dread when I knew it was grooming time. It only took Mother five to ten minutes tonight to pull the burrs from my tail and all the little sticktights off that I get on my legs and body, so she was reasonably happy. Of course, it gave her time to give me a quick bath. She says seven "warm pillow" stains is definitely over the limit! Fenway Bartholomule is hiding his head in shame . . . after admitting that he has a teeny little man-crush on you. You are smokin' in your new do! 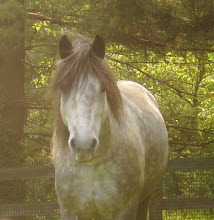 I would seriously sneak you into my own pasture if you lived within stealing distance. Gorgeous. Mother says I can go live with you, but that you'll need to sell A LOT of poems a month to keep me... I guess all my supplements make me less than the simple "pasture puff". Oh I don't think I have ever seen that many burrs in one place - I do like the haircut - makes you look really fast!